Patent Reform is Working, Everywhere but the Eastern District of Texas? Is the American Invents Act working? 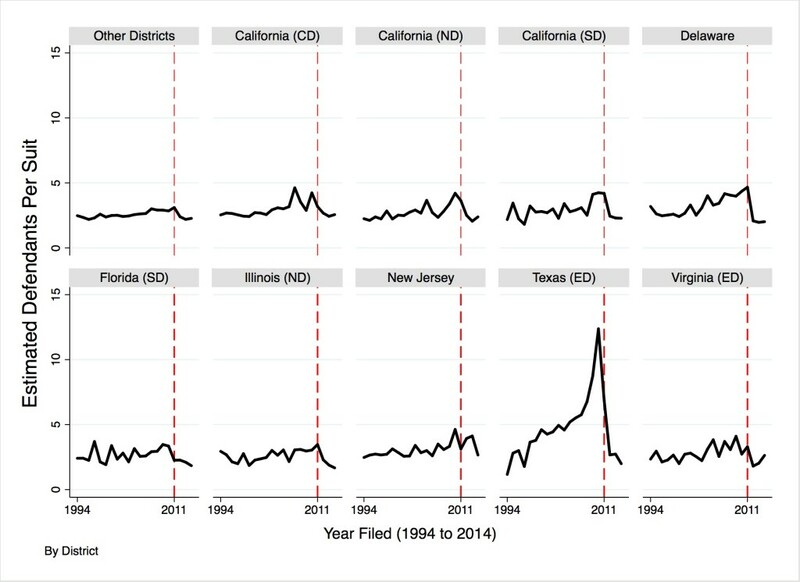 Taking a look at the longterm trends in case filings and the number of unique defendants in each suit, it appears that the America Invents Act (“AIA”) corresponds with a significant reduction in the real rate of patent litigation and a leveling off of the nominal rate of patent litigation. However it is worth desegregating the data to compare the Eastern District of Texas to the rest of the United States. If you believe that most what takes place in Eastern District is patent trolling, then it looks like the AIA has not put a serious dent in that activity. 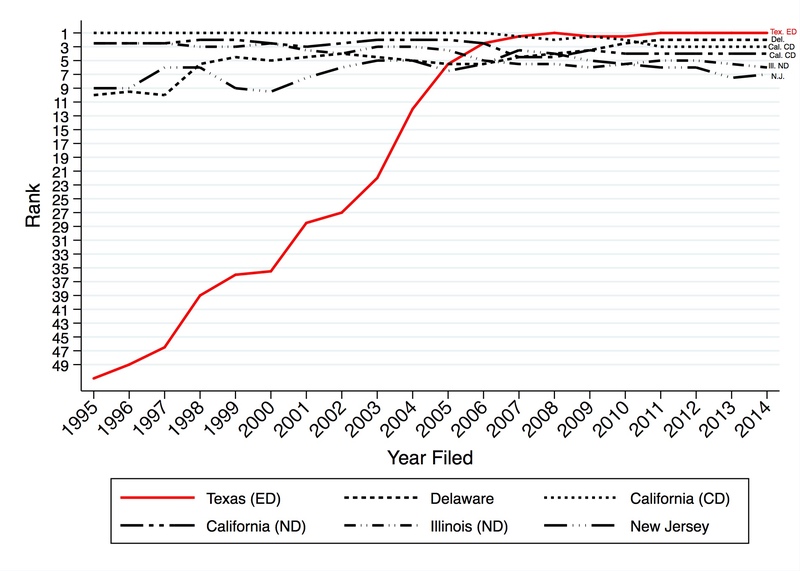 The figure below compares the Eastern District of Texas to the rest of the United States in terms of the number of patent lawsuits filed per year (the bars) and also the estimated number of defendants per year (the scatterplot). Patent Litigation in Eastern District of Texas, All Other Districts Source: Bloomberg Law, 1994–2015. Bar chart depicts cases filed. Scatterplot depicts estimated number of defendants. Linear fit lines from 1994 to 2011 and 2011 to 2015. 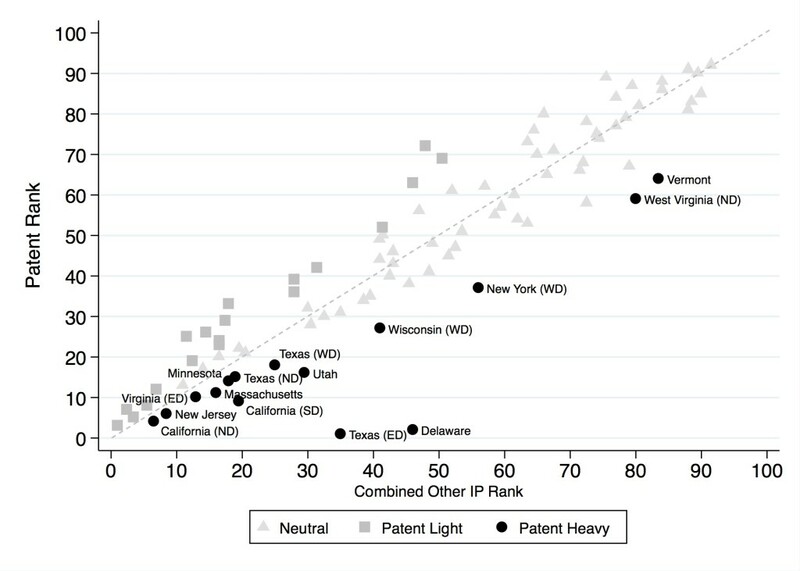 Prior to 2011, the whole country witnessed a significant upward trend in patent suits and patent defendants. The rate of increase was much greater in the Eastern District of Texas, but the trendlines were pointed in the same direction for the district and the rest of the US. The period from 2011 to 2015 saw a marked divergence between the Eastern District of Texas and the rest of the country. In the Eastern District, the number of cases filed increased sharply and the trend (albeit with significant variation) was for the number of defendants to increase as well. 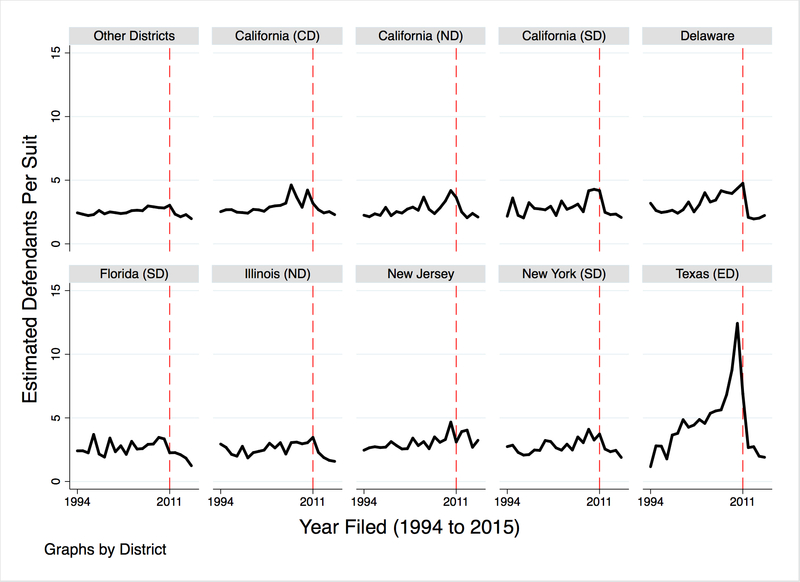 In the rest of the US, the trendline for the number of defendants is significantly downward and there also appears to be a decreasing trend in terms of the number of suits filed. These initial numbers might suggest that the patent reform measures introduced in the AIA have had a significant impact on the extent of patent litigation everywhere but the Eastern District of Texas. Another way to read these figures is as confirmation that the Eastern District of Texas’s concerted efforts at forum selling are continuing to be successful. These explanations are not mutually exlusive. The Eastern District of Texas accounted for just 7.33% of all patent cases filed between 2002 and 2010, but 26% from 2011 to 2015. 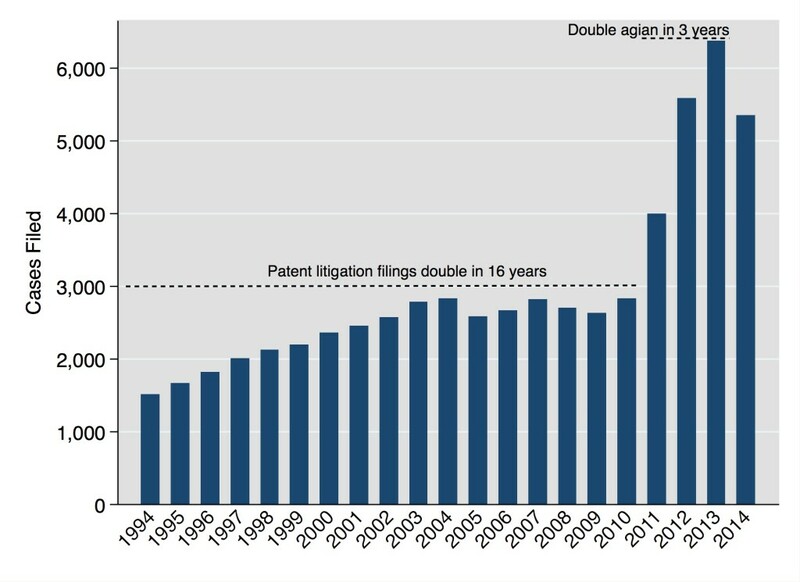 It accounted for 16.39% of all patent defendants between 2002 and 2010, rising to 28.36% in the 2011-2015 period. According to this superficial data (no attempt to control for marco-economic factors), etc, it looks like the AIA is having an effect, just not in the Eastern District of Texas. 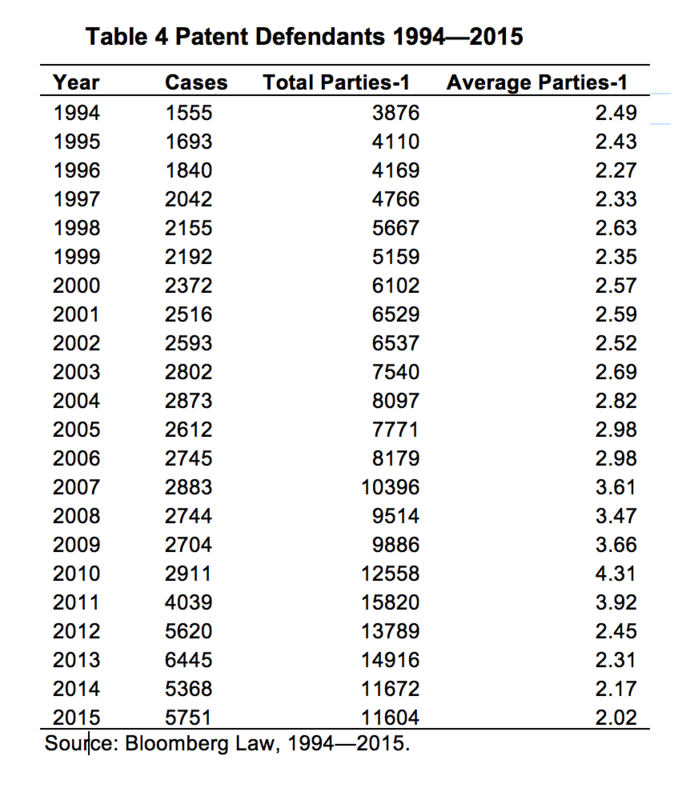 For an extended discussion of the data used in this post, see my forthcoming article, IP Litigation in United States District Courts: 1994 to 2014 (Iowa Law Review, forthcoming 2016). You can download the underlying data on my website (under the publications+/data sets tab). This is the fourth and final post in a series discussing the 2015 Update to the data in my forthcoming article, IP Litigation in United States District Courts: 1994 to 2014 (Iowa Law Review, forthcoming 2016). You can read the 2015 Update in serial form in the posts that follow, or you can download the entire update as a pdf file from ssrn.com. See Suggested citation, Matthew Sag, IP Litigation in United States District Courts—2015 Update (January 5, 2016). Available at SSRN: http://ssrn.com/abstract=2711326. The previous post discussed recent trends in patent litigation and the true nature of the patent litigation explosion. This post concludes with an update to the data concerning the geographic distribution of copyright, patent and trademark litigation in US district courts. 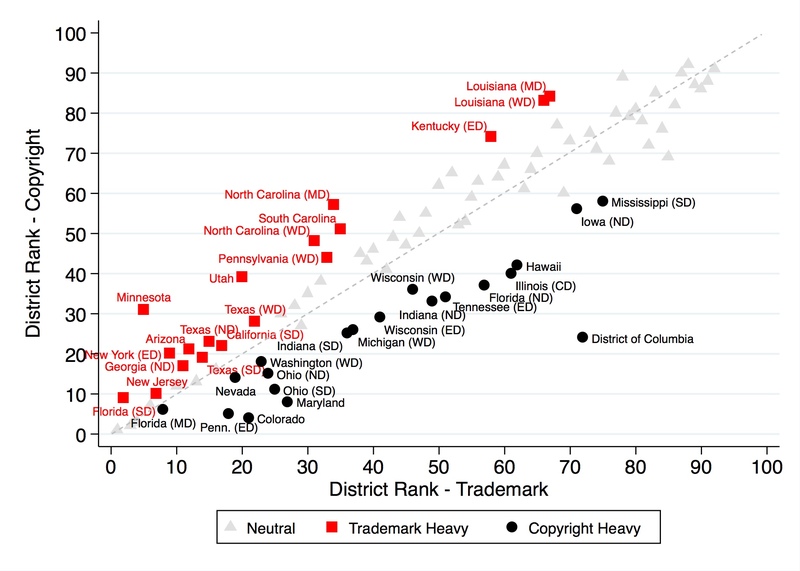 In IP Litigation in United States District Courts: 1994 to 2014, I discussed at length the geographic distribution of copyright, patent and trademark litigation. I have updated the key figures and tables from that discussion below. 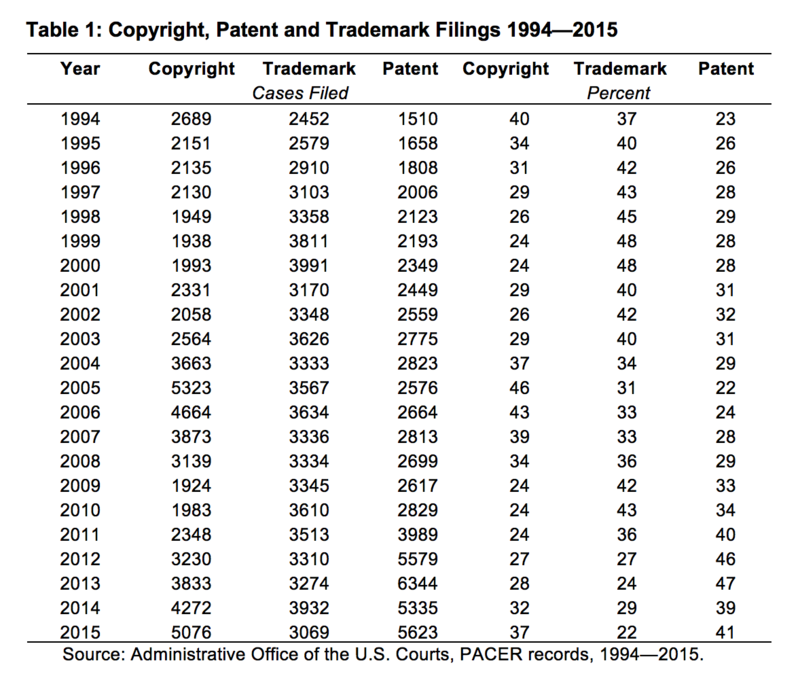 Figure 6 (below) illustrates how the copyright, patent and trademark litigation rankings of selected districts have varied from 1994 to 2015. The associated tables are not particularly easy to read in this format, but I have included them for completeness. They are available in text form in the pdf version of this Update, see Matthew Sag, IP Litigation in United States District Courts—2015 Update (January 5, 2016)(http://ssrn.com/abstract=2711326). This is the third in a series of posts discussing the 2015 Update to the data in my forthcoming article, IP Litigation in United States District Courts: 1994 to 2014 (Iowa Law Review, forthcoming 2016). You can read the 2015 Update in serial form in the posts that follow, or you can download the entire update as a pdf file from ssrn.com. See Suggested citation, Matthew Sag, IP Litigation in United States District Courts—2015 Update (January 5, 2016). Available at SSRN: http://ssrn.com/abstract=2711326. 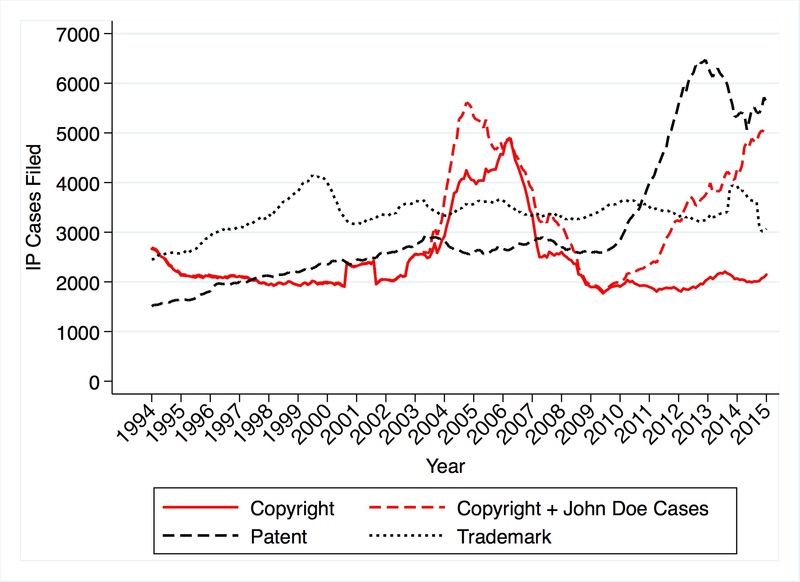 The previous post discussed new data on copyright litigation and the John Doe phenomenon, this post examines recent trends in patent litigation and the true nature of the patent litigation explosion. As I explained in IP Litigation in United States District Courts: 1994 to 2014, the filing data gives a misleading impression of the true extent of patent litigation because the rules relating to joinder changed in 2011 with the passage of the America Invents Act. 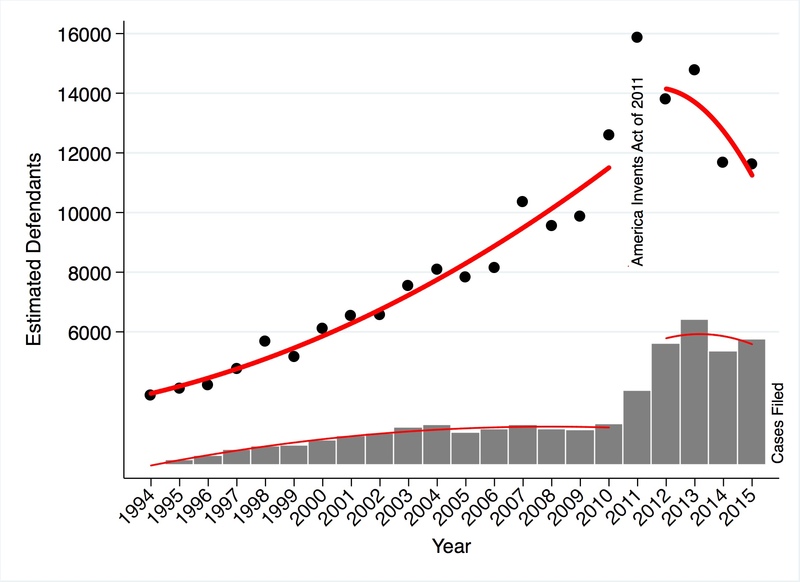 At first glance, it looks as though there was an enormous spike in patent litigation between 2010 and 2012; however, this spike is at least partly attributable to an important procedural change brought about by the AIA. 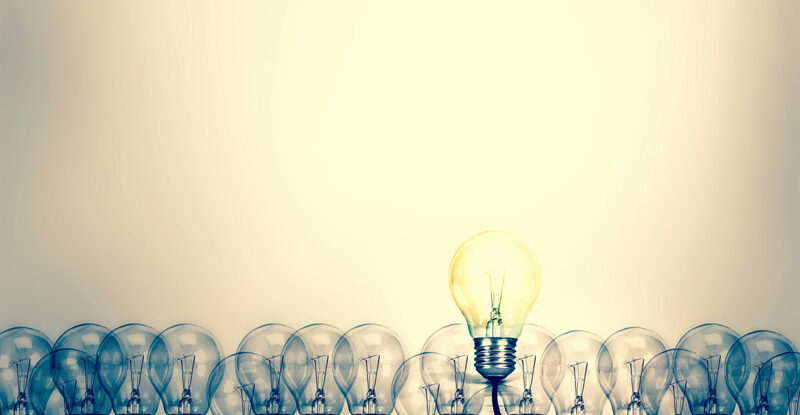 Prior to the AIA, it was common for patent plaintiffs to join multiple unrelated defendants in a single lawsuit based on a commonly-asserted patent or patents. The AIA ended this ruse and resulted in a nominal explosion of patent infringement lawsuits. 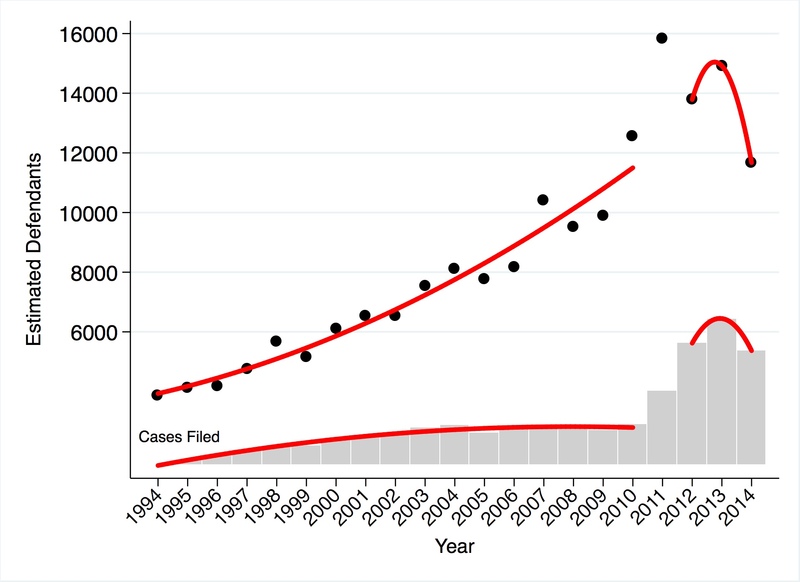 Figure 4 (below) shows the number of cases filed in each year from 1994 2015 (see the gray bars) but it also shows the estimated number of defendants for each year. Essentially, prior to the America Invents Act of 2011, the true extent of litigation was disguised through permissive joinder of unrelated (or tenuously related) parties. This practice was particularly common in the Eastern District of Texas, the patent troll’s favorite hunting ground (see Figure 5 (below)). Note that although the trend in patent case filings is more or less flat between 2012 and 2015, the number of patent defendants has sharply declined over the same period. Source: Bloomberg Law, 1994–2015. Bar chart depicts cases filed. Scatterplot depicts estimated number of defendants. Quadratic fit lines from 1994 to 2010 and 2012 to 2015 are drawn for illustrative purposes. The data underlying Figure 4 is also presented in tabular form below. Figure 5 (above) shows the estimated number of defendants per suit for the nine most popular federal districts from 1994 to 2015 and also for an aggregation of all other districts. The vertical dashed line is set to 2011 to mark the passage of the AIA. It is starkly apparent that the trend toward more defendants was driven by the Eastern District of Texas. 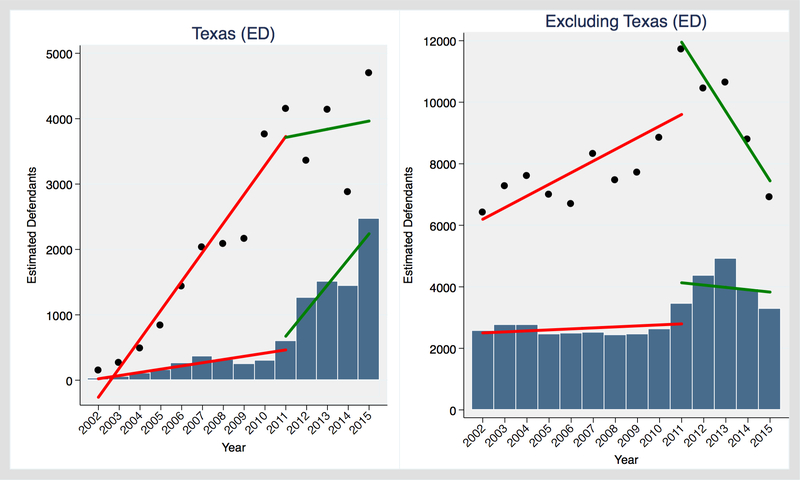 The estimated number of defendants in Eastern District of Texas climbed steeply from 1.66 in 1994 to 12.37 in 2010 and then dropped precipitously down to 1.99 in 2014. It has fallen further in 2015, to 1.90 defendants per suit. This is the first in a series of posts discussing the 2015 Update to the data in my forthcoming article, IP Litigation in United States District Courts: 1994 to 2014 (Iowa Law Review, forthcoming 2016). My original piece, IP Litigation in United States District Courts, undertakes a broad-based empirical review of Intellectual Property (IP) litigation in United States federal district courts from 1994 to 2014. This brief update extends that data to include the year 2015. For a detailed discussion of the data sources and methods, please refer to the original article. the geographic distribution of copyright, patent and trademark litigation. You can read the 2015 Update in serial form in the posts that follow, or you can download the entire update as a pdf file from ssrn.com. See Suggested citation, Matthew Sag, IP Litigation in United States District Courts—2015 Update (January 5, 2016). Available at SSRN: http://ssrn.com/abstract=2711326. 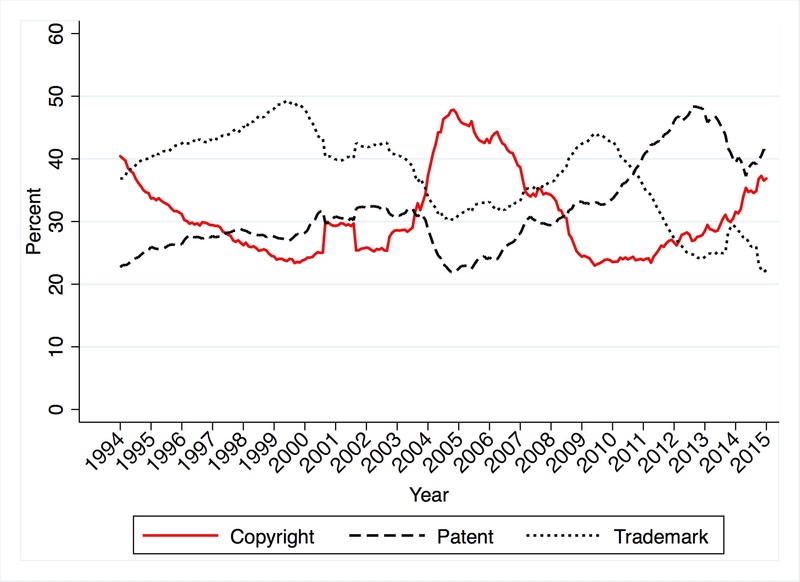 The two most important trends in IP litigation over the last five years have been the extraordinary increase in patent and copyright litigation and the corresponding relative decline of federal trademark litigation. These trends continued in 2015. Twelve month moving average of percent of Federal IP litigation. Source: Administrative Office of the U.S. Courts, PACER records, 1994—2015. 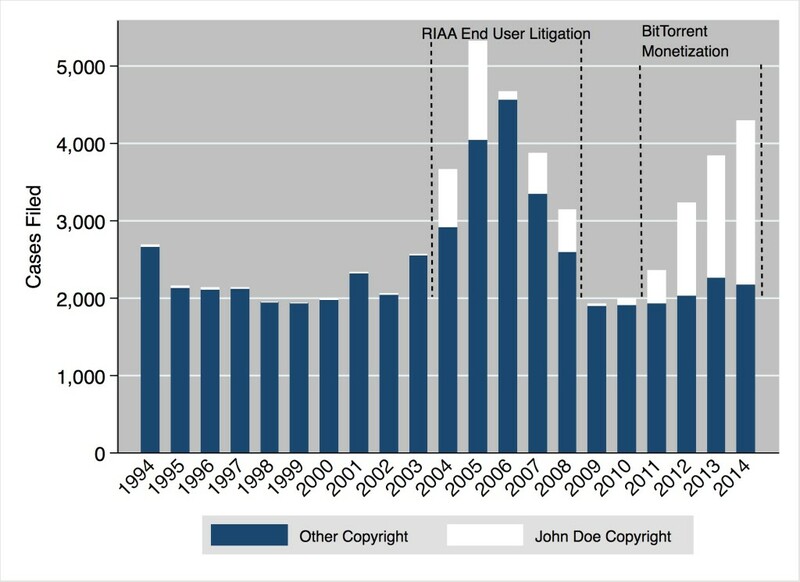 Figure 1 (above) shows the relative proportions of copyright, patent and trademark cases filed, based on a 12 month moving average between 1994 and 2015. 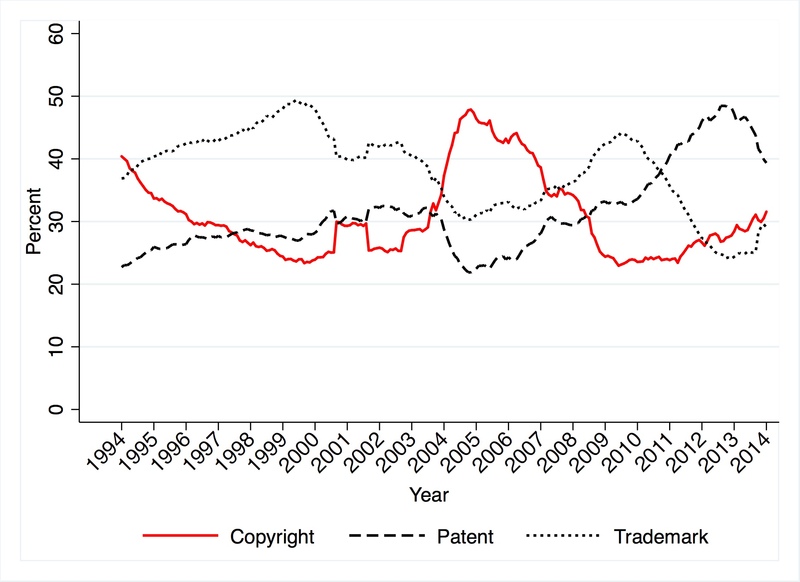 As the figure makes plain, the relative shares of copyright, patent and trademark have fluctuated quite significantly over the period. The proportion of cases in the federal IP docket did not change significantly from 2014 to 2015 (39% in 2014, 41% in 2015); however, copyright increased significantly from 32% to 37% and this was matched by a corresponding decline in trademark litigation from 29% to 22%. Complete year-by-year data from 1994 to 2015 are presented in Table 1 (below). 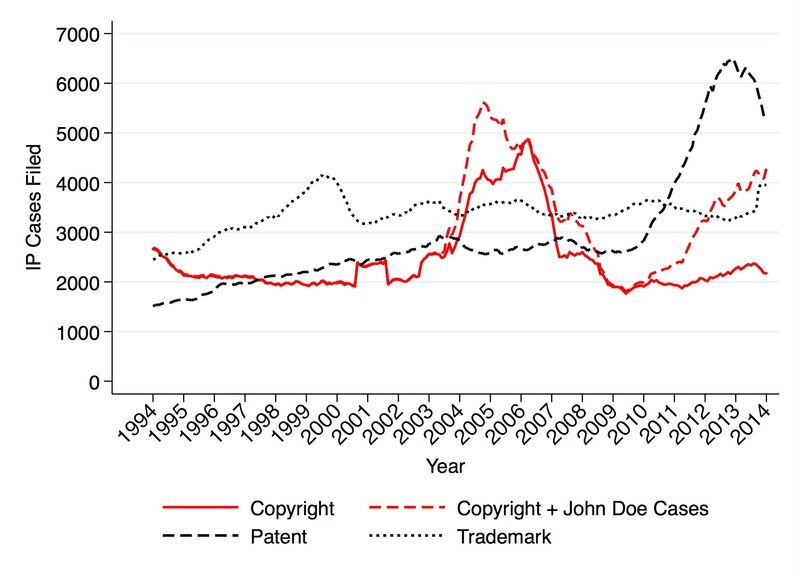 The increase in copyright and patent litigation can be seen even more clearly in Figure 2 (below) which shows the raw number of cases filed for each type of IP (displayed as a 12 month moving average). Twelve month moving average of cases filed. Source: Administrative Office of the U.S. Courts, PACER records, 1994—2015.